If you're looking to spice up your HIIT workouts then adding dumbbells is a great way to get started. Last week I said I'd give you another full body dumbbell circuit and as promised here it is. We love doing circuits. Demi, being a stay at home mum looking after our youngest son is always short of time. So when she does have time to workout a circuit is ideal. As she can't get to the gym, working out at home is her only option at the moment, plus it's free! And we love free. So last year I got Demi a pair of 12lb dumbbells which were ideal for this workout. I like rubber fixed weight dumbbells as they don't move when you do exercises like renegade rows plus they are silent so if you workout in the morning or if you have young kids and workout when they nap you can work out in relative silence. So if you are short of time and or need a home workout then this your ideal solution. Its short and can be done in under 20 minutes and all you need is a set of dumbbells. Dumbbell workouts are awesome as you can add a load of new exercises to your HIIT workouts to make them more interesting and challenging. Which is especially important if you've been doing bodyweight only HIIT for a while and feel you need a new stimulus. What's even better is you'll be hitting a whole new bunch of muscles that you perhaps weren't activating before. There are some really good Glute and thigh exercises you can do with dumbbells. Most of my clients experience faster body shape changes once they introduce weights into their workout routines. If you are looking for a balanced workout that will burn lots of calories and get fitter and more toned fast then this full body dumbbell circuit will be just what you are looking for. All the moves in this circuit will help you develop a well defined and balanced physique. Make sure you do a quick 5-10 minute warm up before you dive into this workout. What you need - A good Exercise Mat like this one and a pair of Dumbbells like these. Anywhere form 8-12 lb Dumbbells for a beginner is fine. I saw this and wanted to try it with my clients. While I can do it, it's a very advanced move. With HIIT you want to be able to move with pace through your workout but for most of my clients this just slowed them right down. Try it and see if you can do it, if its too much or you find its slowing you down remove the burpee part of this exercise. On your way back down to the floor aim to land gently going straight back into a squat to repeat. There should be no braking of the movement. We love thrusters, they are one of the best metabolic exercises which makes them great in any workout plan where you want fast results. We've made a slight change to make it more interesting by making it a split squat rather than a traditional squat. We hope you like it. Start by holding the dumbbells on your shoulders with your legs split. one leg forwards and one leg back. If you kneel down to the floor both knees should be at 90 degree angles. lower your back knee down towards the floor, touch it if you want very lightly. Push back up and as you reach your start position push your dumbbells up and above your head with fully extended arms (avoid hyperextending). This completes one rep. Complete 20 total reps swapping your lead leg after 10. Another great core HIIT exercise that will target your lower abs plus much more. In the low plank position jump your legs out to shoulder width and then back in again to toes together. Maintain a flat back and straight legs throughout. Another great all over dumbbell exercise that works multiple muscles for maximum burn! Start by standing in a wide stance, Toes turned slightly out with the dumbbells in your hands and palms facing inwards towards your body. Imagine you are holding a bar in both hands. Drop into a sumo squat by pushing your hips down and back and allow the weights to drop with you maintaining a nice upright position. Try to let your hips line up level with your knees before standing back up. Stand up and once you reach your standing position pull the dumbbells up close to your body until they reach your sternum or your elbows are level with your shoulders. This completes one rep - Perform 20. If your weights are too light that is fine, just work faster for a cardio HIIT workout. If they are too heavy you can reduce the amount of reps on that exercise. You don't really want to stop moving for long. Moving from one exercise to the next with minimal rest. So like I said earlier Demi needed to improvise a little with the workout. The dumbbells were too heavy for the split squat thrusters so once she couldn't do any more we dropped one dumbbell and used just the one to push up with two arms so she was able to complete the set of 20. 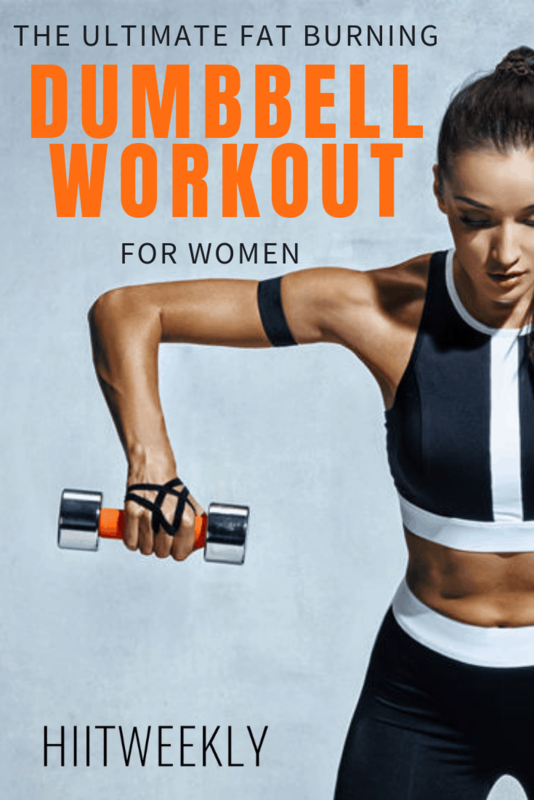 This workout is also great if you can use a gym and you like to be out of the way, all you need to do is find a pair of dumbbells that you can use for the whole workout and then find a workout space and stay there until you're done. finish off this dumbbell workout with some killer ab moves. Get 5 FREE Ab workouts sent to your inbox now. Keep working hard, that dream body is yours for the taking.